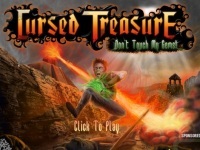 The Cursed Treasure game is a tower defense game where you need to protect precious gems from the growing wave of invaders, demons and monster. This is a complete action packed game that comes with full thrilling experience, and there are several levels where you need to test your strategy skills and other qualities. Here, each level used to feature a different layout so your tactics must change in this regard. For effectively playing this game, you can use your computer mouse button to build, upgrade and casting magic. To upgrade a tower you are required to make sure that the tower is eligible for the upgrade or not. This game comes packed with stunning graphics and action thrilled as here you need to defend and protect the gems from the hand of demons and monsters. Thus, all these remarkable, thrilling features have made Cursed Treasure an addictive tower defense game. This would be a perfect game for you to play with your friends for leisure hours. Players scored and rewarded experience on a three-star system that used to keep track of whether enemies is heading towards the Gem or not and take them out of the field of play. The fundamentals of Cursed Treasure will not going to deviate significantly from the most TD titles, as there are some of the coolest nuances that will make the game always looks fresher. Towers can be given some impressive upgrade depth in the play thus forcing players to choose all multiple trees of the same tower all within the part of the same game. Conquer other faction for glory in 3D styled RTS game. Manage your shooting towers and defeat all opponents in this 3D-styled tower defense game.